Fitness equipment is the biggest class of capital assets (and possibly of hassles too) you’ll have to deal with when you’re operating a workout facility of any kind. Once you have the equipment in place you need to ensure that it stays in working order for as long as you need it with regular maintenance and upkeep. To make best use of your facility you must keep all of your equipment up to date and working. When a large piece of equipment is “Out of Order,” it’s just a giant lump of metal sitting in the way and sending out bad vibes to everyone in the room. Not only do you lose capacity when a treadmill, stair-stepper or elliptical machine goes down, you lose the square footage that it occupies. Your gym just got smaller like you doubled the hassle of the breakdown. Then, double it again just because it’s next to a mirrored wall and so it’s a virtual eyesore staring at your users as they work out. That’s the visual impact of non-functioning equipment on your workout space. Nobody likes to see ‘Out of Order’ signs on the fitness equipment at your facility—not you and certainly not your members. Out-of-order machines are a major inconvenience, and frustration for everyone involved. That’s why it’s so important to invest in superior, low-maintenance commercial fitness equipment and take care of that investment with regular maintenance and upkeep. Keeping your workout equipment safe and working well is like chefs keeping their knives sharp or soldiers keeping their weapons clean. You absolutely must make sure that it works without a squeak or a rattle, to retain the confidence of your members. The three parts to keeping your equipment in working order are: selecting the right fitness equipment initially, follow a set maintenance routine, and keep your warranties and service agreements up to date. Preventive maintenance can make a tremendous difference in maximizing the life of your cardiovascular and strength training equipment. When you take outstanding care of your machines, it really shows. Preventive maintenance easily can add four or five years to a machine, maybe more. Maintaining your commercial fitness equipmentwill prove to be more cost-effective. 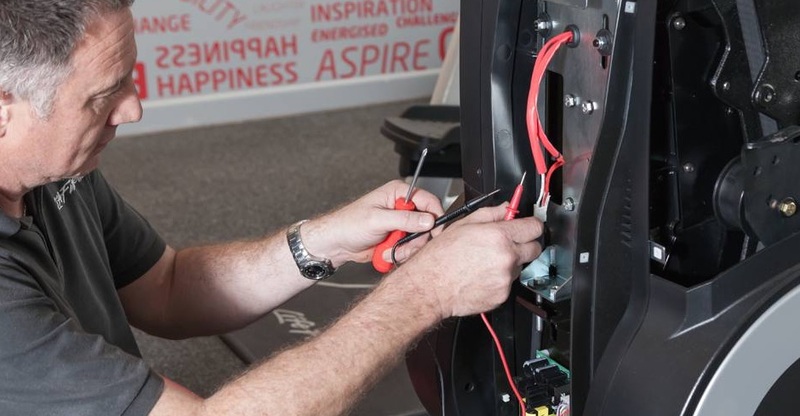 You will no longer be spending time and money repairing and replacing fitness machines. Plus, tip-top equipment that’s in working order keeps users happy and working out whenever they choose. It can lead to longer equipment life. We understand that operating a fitness facility means you’re expected to maintain what seems like an overwhelming number of machines. Maintenance is unfortunately going to get overlooked from time to time, especially if you have a large selection of equipment. However, not maintaining your machines, can lead to shorter machine life and result in spending thousands of dollars to replace them when they gives out. It helps keep users satisfied. It’s hardly ideal for someone to walk into your fitness center and three of the five treadmills are “Out of Order” and needing maintenance. A well-maintained machine will not only provide the best workout possible to a customer, but also reduce the chance of injury. Not to mention, if your equipment is always out of order, people will eventually get fed up and look for a gym elsewhere that has equipment available and is well-maintained. It keeps people coming back.Equipment that isn’t working forces people to either wait for the working equipment to be available or cancel a workout all together. Both options cost users time and lower their opinion of the facility as a whole. Keeping equipment clean and sanitary daily helps keep everything working and prevents the spread of germs. It also shows that you care about your facility and your users’ well-being. Removing sweat, dust, and dirt will help electronics and upholstery last longer, as moisture can cause corrosion, and the buildup of dust and dirt can contribute to a heat overload can cause a motor failure. SOFITCO’s preventative maintenance program is designed to keep your equipment in the best condition possible, with a specific plan that provides your fitness facility with a regular servicing schedule. Talk to us about all of our SOFITCO services.